Apple at the WWDC 2018 announced macOS 10.14 Mojave as its newest macOS version. The new platform for MacBook and Mac devices is designed to take the Mac computing experience to new levels. It comes with a dedicated Dark Mode and includes the all new Apple News app. The new macOS also comes with a redesigned Mac App Store that has a new interface and editorial sections - similar to the iOS App Store redesign that came with iOS 11. While the developer preview of macOS Mojave is currently available to Apple Developer Program members, the public beta of the new macOS will be available to Mac users in late June. The stable release will roll out for all Mac devices introduced in mid-2012 or later, 2010 and 2012 Mac Pro models with recommended Metal-capable graphics cards by this Fall. As a successor to macOS 10.13 High Sierra, macOS 10.14 Mojave has tonnes of new changes. The very first in the series of new changes is the Dark Mode that as Apple's SVP of Software Engineering Craig Federighi highlighted is inspired by the desert at night. The Dark Mode is quite useful especially for users who work on their new projects at night. Users can toggle between a light and dark desktop as well as add the darkened colour scheme to built-in Mac apps, including Mail, Messages, Maps, Calendar, and Photos. Apart from the dark design elements, Xcode now also supports Dark Mode. The Cupertino giant has also added a new Dynamic Desktop feature that automatically changes the desktop picture to match the time of the day. Further, an API will be available to let developers implement the Dark Mode in their apps. After the Dark Mode, macOS 10.14 Mojave has Desktop Stacks that lets users organise their desktops by automatically stacking files into neat groups based on file type. Users can also customise their Stacks to sort the clutter based on file attributes such as date and tags. Finder on macOS 10.14 Mojave has also received a major overhaul as it now gets an all-new Gallery View to let users view all their files visually. The Preview Pane now also offers all the metadata of any particular file. Similarly, there are Quick Actions to let users easily password-protect PDFs or run custom Automator Actions on files simply through Finder. There is also a Quick Look to provide a full-size preview of a file, allowing users to rotate and crop images, mark up PDFs, or even trim a video or audio clip - all without opening an app. 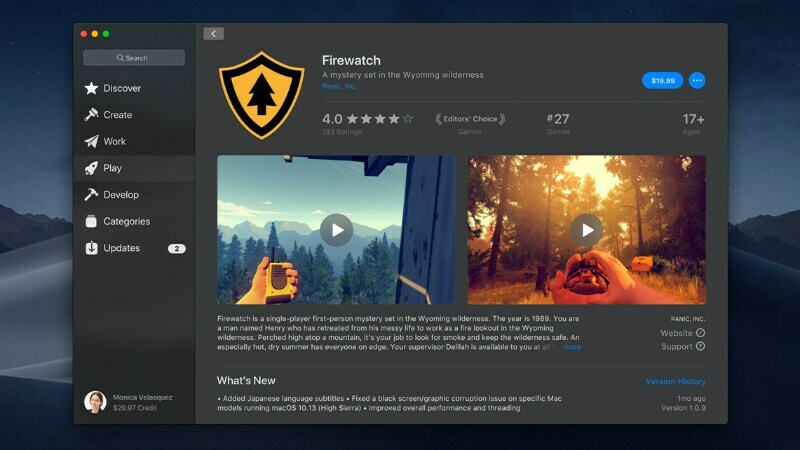 Alongside the upgraded experience through the Dark Mode and the new Finder, Apple has brought the all-new Mac App Store to macOS 10.14 that has a new look and rich editorial content, matching the iOS App Store that has similar elements since the release of iOS 11 back in September 2017. The new Mac App Store has Create, Work, Play, and Develop tabs to let users easily find what apps they need to install on their devices. Also, there is a Categories tab that lists all the apps category-wise. The Updates tab also exists to list all the apps that need to be updated. For an advanced experience, the new Mac App Store features a Discover tab that lists in-depth editorials about the best Mac Apps through stories and collections. It also provides a view to the most popular apps with top charts. Similarly, there are videos that autoplay to give dynamic app previews to users. Autoplay videos are notably something that are not yet available on the iOS App Store. Apple at the WWDC keynote mentioned that while the Mac App Store already has a large number of Mac apps, Office 365 from Microsoft, Lightroom CC from Adobe, BBEdit from Bare Bones, Transmit from Panic, Live Studio from Snap Inc, and Houseparty are some of the upcoming apps to make the Mac App Store more useful for the masses. Apart from the Mac App Store, macOS Mojave comes preloaded with a few new apps, including News, Stocks, Voice Memos, and Home. These are already available on iOS and are now heading to macOS to bring a unified experience across major Apple platforms. The company noted that these apps were brought to the Mac from iOS by using iOS frameworks adapted to macOS. Apple says it will provide these frameworks to developers in late-2019, making it easier for them to port their iOS apps to macOS, while adapting simply to the different interfaces. Apple also showcased Group FaceTime, the feature that is debuting on iPhone and iPad with iOS 12, allowing users to easily chat with multiple people at once. There is also an upgraded Safari with an enhanced Intelligent Tracking Prevention to help block social media "Like" or "Share" buttons and comment widgets from tracking users without their explicit permission. There is also a simplified system information that will be presented to users when browsing the Web to prevent them from being tracked. The Web browser now also automatically creates, autofills, and stores strong passwords at the time when users create new online accounts. It also flags reused passwords to protect online presence of users. Further, there are new data protection requirements that apps need to get from users before obtaining access to the camera and microphone or accessing personal data like user Mail history or Messages database. The new macOS additionally has the on-screen controls to easily capture accurate screenshots. There are also new video recording capabilities, and a streamlined workflow to share a screenshot without saving it on the desktop. Moreover, the updated macOS has markup tools within Finder, Quick Look, and Screenshots to make it easier to add comments to content and share them with others. There is also a new Continuity Camera feature that lets users take photos on nearby iPhone or iPad and have them appear on their Mac instantly.